I woke up after a short night of weird, jet-lagged sleep on Wednesday before the race, in a house we rented in Copper Mountain. After an American coffee, I decided to run the 20k over the highest pass on the race course. I got company with a man who was supposed to run the race as well. Company is fun but a lot of the times when I’m out running, I like to be by myself. So I was thinking that maybe I can speed it up a little to be left alone. I started to speed up even though I must say I liked the company. I tried to run faster but my breath sounded strange and somehow I couldn’t get enough air down the lungs. What is this? I have never felt like this before! Is it the jet lag? I made up my mind and decided that the reason for my strained breath was the long travel and the jet lag. I have spent the summer in the Alps at 1,000 meters above sea level, so I should be okay here. I have a long summer of running in my legs so this will be okay anyway. I only need to finish after Francesca Canepa to win the Skyrunning Ultra Series. I should be able to do that; she just won Tor des Géants. It’s not a race for me. It’s flatter and less technical than the races I’m good at. So I don’t need to do it well. But it was still not the best charge to get tired from walking up the stairs to the kitchen in the mornings. I also need to add that I never feel really prepared or in a good shape. I have been thinking about why and maybe it’s because I do quite many races both in summer and wintertime. If I would feel prepared and focused on every race, it would take much more energy and power from me instead of seeing the race as a good training. When the race day arrived, I felt that I could breathe better than the days before, so that was a good sign. My plan for the race was to start slow. I knew that Michele Yates had run a 100 miler two weeks before and I knew that, in a normal day, I should have more speed than Kerrie Bruxvoort and Francesca. I needed to take it slow, because they normally have more endurance than me. So to say had a plan. What I didn’t know was that Stephanie Howe was going to run. I found out when she passed me on the second climb. That was pretty early in the race and I felt the altitude badly. I just couldn’t move fast. My heart beat like I did sprint intervals but my legs moved as they walked. Stephanie had some minutes on me on the climb but, in the downhill, I ate up them all. The downhill to Copper Mountain was so beautiful! It was a lot of snow and wind and cold, but the view and the feelings up there were fantastic. The downhill passed so fast, and so came the road. I never run on them. I think cars are made for asphalts but not animals. But I was prepared for this and for everything that’s new for me, I can somehow find a little interesting. I started my playlist on my phone and started to take kilometers after kilometers. Kind of nice! It was interesting to think about moving as smooth and fast as possible on such a flat ground. After the road part, I was mostly alone. I stopped for long in every aid station and ate potato chips and chattered with the crew there. I couldn’t think about how many kilometers were left. I just focused on what was now. When the thoughts came about how many hours or how many kilometers I had left, I worked hard to get them away. And when I started to feel tired, I put that away and started to feel gratitude. I am a lucky girl. I have the opportunity to run wherever I want and my body loves it. How hard should it be for me to appreciate that? I have chosen this race and I better do the best of it. I don’t like to feel spoiled so I just bite my mouth and kept running. On the last downhill on the road down to Vail, I started to think back on the race. It certainly offered some magic views, some wild, lonely mountains in sight, and a feeling of being small. It also gave us demanding parts on road, and the altitude makes it hard to run fast even though it’s flat. And for sure it was a little different Skyrunning race than those I’m used to. We all know that. But different can be good and if we don’t try, we will never know what is good and what’s not. Thank you all for running, cheering, and inspiring me!! Emelie Forsberg runs for Salomon. 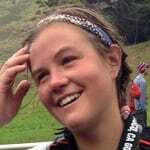 In 2012, she won the Skyrunning World Series and The North Face Endurance Challenge 50 Mile championships. Thank you for this great report! Enjoyed that and congratulations to you. Gratulere Emelie! Utmerket løp og en fin sammendrag av dagens bevigenheter. Tusen takk! ….and so came the road. I never run on them. I think cars are made for asphalts but not animals…. Thank you for the report and congratulations!!! good luck on Sunday!